This short story was submitted to Terasem’s Journal of Geoethical Nanotechnology by Keith Henson, electrical engineer, proto-transhumanist, and writer on life extension, cryonics, memetics, and Evolutionary psychology. Keith’s short story, to be published within a web-book entitled, “Standard Gauge”, to be posted on his independent website, transports the reader on an exploratory journey into the post singularity, near-future technology of an Artificial Intelligence directed clinic in Africa. Note: This story is Chapter Two in “Standard Gauge”. We are pleased to present the later-published Chapter One and Chapter Three as well. Lothar, a heavy-set black man, was dressed in lightweight khaki shorts and a fishnet shirt. He wore old running shoes without socks; an outlandish Australian bush hat folded up on one side over his thick gray hair, and carried a pouch at his belt. Lothar’s younger appearing companion, Mabo, was armed with an AK-47. Mabo sported cut off 501 jeans, a ragged red tee shirt and a fairly new pair of running shoes. In place of a hat he had an American-style bright blue "do-rag" over a reversed baseball cap. Both the bush hat and the “do-rag” were made of utility fog. The fog interfaced to their neural implants. The tata, a mud walled settlement of 21 traditional round houses with palm frond roofs, was set against the wall of a wide wadi. The tata incorporated two rusting metal roofed buildings that were too hot to live in during the dry season (which was just starting) but made adequate storage sheds. Outside the wall were more than a dozen melted-down-to-stumps ruins of other round houses--the result of smallpox that had slopped deep into Africa after being released by a desperate Russia during the "-stan" wars on their southern border. Rumors of miracle working strangers had been rife for weeks among the Tamberma  so the appearance of the duo's Land Rover at the gate of the tata was not a complete surprise. The Land Rover had several dozen little hooks welded on it. On many of the hooks were hung fetishes of obvious potency. Lothar introduced himself in Tamari with more than a hint of Ditamari,  but could be understood. His ethnic background was hard for the villagers to judge. There seemed to be a lot of European in his features, but (because his skin was set to “dark”) he was as black as the villagers. Mabo had features more typically African. Both of them moved with the easy grace of the rejuvenated. The tata inhabitants greeted both cordially. Rich visitors had been common a generation ago but were so rare now that the children hung back and did not beg. The visitors turned out to be good guests, providing several large tins of meat and a sack of ground corn. Two of the tins were opened, mixed with corn and along with local vegetables cooked up by the women into a communal meal. During the repast, Lothar was asked the provenance of his name. "One hundred years ago an African, a 'Prince of the Seven Nations,' named Lothar lived many day's walks from here." Lothar pointed vaguely to the southeast. "A powerful white magician, Mandrake, came to Africa to learn our magic." This visibly impressed the villagers. Lothar touched his hat--which morphed into a fez and then with another touch into a magician top hat. "Prince Lothar became Mandrake's friend. He gave up his claim to be king and went across the sea to be Mandrake's companion." "I carry his name and his mana." Lothar touched his hat--which morphed into a fez and then with another touch into a magician top hat. A third touch brought the hat back to the bushman hat configuration. There was a good deal of ooing and ahhing over this, partly because the ambiguities of the language made it possible that Lothar was a prince. Well, anyone with a Land Rover and an armed servant had to be something special. Lothar's mission (explained to the elders when the children had gone to bed) was to trade for one of the tata's fetishes. "I am fated to experience a great danger." Lothar told the tata dwellers. This boggled the tata elders. What would a man with a Land Rover and an armed guard consider great danger? "I was instructed by a powerful seer 'Foundation Gates' to obtain a protective fetish from as many Tamberma tatas as possible." "The only thing I have to trade for one of your valuable and powerful fetishes is a seed that grows into a clinic." "The man may be a shaman, but he's barkin' mad!" said Elder 1. "Yeah, but that's no reason not to rip him off," commented Elder 2. "I don't think we can get any more canned meat, or corn meal. The kids looked." said Elder 3. "We have plenty of fetishes from the houses of people who died of the pox." "He didn't say he needed one that worked." "Do you think this 'clinic seed' is worth anything?" The nearest medical help was a day's walk for a healthy person. With fuel for wheeled transport being hard to get, the seriously sick or injured would sometimes die on the way. "Strange tales have come from the North, it might be." After some hard bargaining, the tata elders swapped a prime monkey skull fetish for a clinic seed. The planting was to be made in the morning since the Land Rover was parked outside the wall. In the middle of the night there was an appalling inhuman scream. The local leopard had made an unwise decision to mark the strange smelling object that had intruded into his territory. Unfortunately for the leopard, urine is a decent conductor at 50,000 volts and when he did there was a bright blue flash behind him. Fortunately for all concerned, the cat was not pointed at the tata entrance when he sprayed. The leopard stopped to lick his tingling privates after bounding half a kilometer. Mabo, who slept in the Land Rover, turned off the high voltage anti-theft circuit before he got out in the morning. Breakfast was a small amount of leftover dinner and portions of millet porridge. After eating, Lothar accepted his newly acquired fetish and hung it on an empty hook. "In order for it to grow properly and to know to whom it belongs, it must be touched here on this sticky patch by everyone in the tata." He and Mabo maneuvered the Land Rover to the spot picked by the elders. They got between the seats and the seed and pushed the half cubic meter clinic seed to the back of the Land Rover with their legs. There were fabric loops in the top, and with the help of some stout poles and half a dozen men from the tata, they got it on the ground and moved into a place where the village walls could be extended to it when it grew up. "In order for it to grow properly and to know to whom it belongs, it must be touched here on this sticky patch by everyone in the tata." Lothar told them. Most of the tata inhabitants were close by watching the "planting" so this went quickly. "Now it needs water so it can start to grow." Since the villagers were farmers, this made sense so they dutifully poured 100 liters of water into a hole in the top of the seed. Fortunately the spring they used was not far away and this soon after the rainy season was flowing well. 2. Utility fog  hypothetical collection of tiny robots, envisioned by Dr. J. Storrs-Hall while he was thinking about a nanotechnological replacement for car seatbelts. The robots would be microscopic, with extending arms reaching in several different directions, and could perform lattice reconfiguration. 3. Wadi - a dry riverbed that contains water only during times of heavy rain. 4. 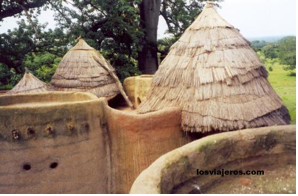 Tamberma (Valley) - near Togo, West Africa, and its unique collection of fortified villages were founded in the 17th century by people who fled the slaving forays of the Benin's Dahomeyan kings. 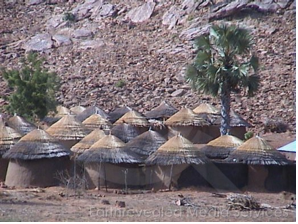 The valley was isolated until recently but is now the closest thing northern Togo has to a tourist hotspot, with the attendant overzealous guides.